Presenting you the official trailer of upcoming Marathi movie ‘Luckee‘ releasing on 7th February 2019. Starring – Abhay Mahajan, Deepti Sati, Chetan Dalvi, Shashank Shende, Atul Todankar, Ramesh Wani, Mayur More, Shubhangi Tambale. Directed by – Sanjay Jadhav. Story and dialogues – Arvind Jagtap. 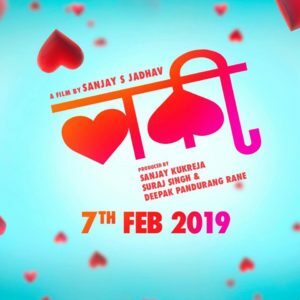 Screenplay – Arvind Jagtap, Sanjay Jadhav. Singers – Bappi Lahiri, Vaishali Samant, Amitraj, Chaitanya Devadhe. Music Directors – Amitraj, Pankajj Padghan. Producers – Deepak Rane, Sanjay Kukreja, Suraj Singh. Like and share this video. Subscribe to our YouTube channel MarathiCelebs_Com for latest entertainment updates and press the bell icon to get notified about all the new uploads.